On October 10, 2018, the Trump Administration published a proposed rule to change the administration’s “public charge” policies. Public charge is a term used by the Department of Homeland Security to refer to a person who receives public cash assistance, income maintenance, or institutionalization for long-term care at the government’s expense. A person who is considered to be a public charge may be denied admission to the US or lawful permanent resident (green card) status. The Trump Administration’s proposed rule expands benefits considered in determining who is likely to become a public charge. Programs targeted include: non-emergency Medicaid, supplemental nutrition assistance program (SNAP), Medicare Part D Low Income Subsidy, and housing assistance (including public housing, Section 8 housing vouchers, and rental assistance), among other new and expanded standards. Additionally, DHS is looking for comments on the inclusion of Children’s Health Insurance Program into public charge consideration. CHCANYS is working with the National Association for Community Health Centers and Protecting Immigrant Families campaign to develop coordinated comments demonstrating the severe negative consequences of the proposed rule. Comments must be submitted by December 10, 2018. To view the proposed rule and/or submit comments, click here . For additional resources, please visit the National Immigration Law Center’s webpage . You can also join the conversation on Facebook and Twitter . 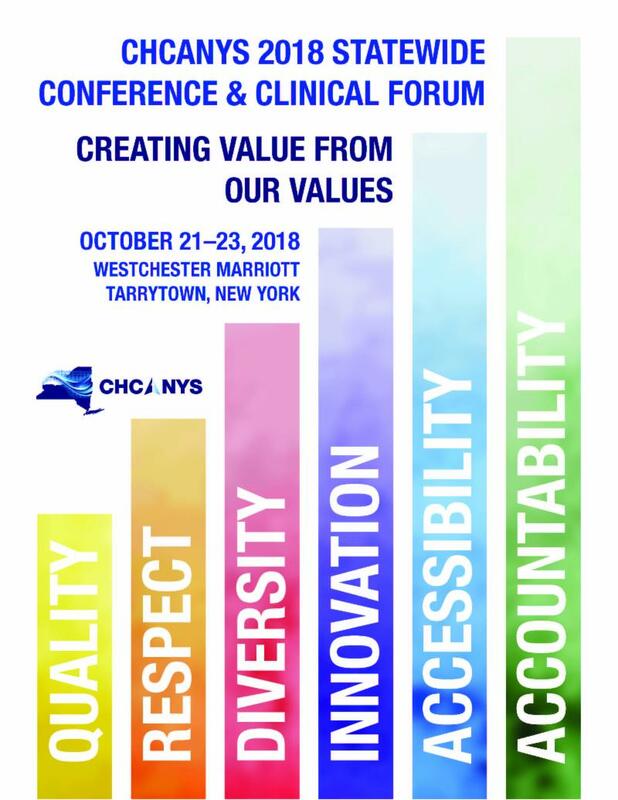 On Sunday, October 21, CHCANYS18 Annual Conference and Clinical Forum officially gets underway at the Westchester Marriott in Tarrytown. Hundreds of FQHC leadership, staff, and partners have already signed up to be part of this year’s event, which will provide attendees with an opportunity to learn from industry experts and one another about current issues and initiatives impacting New York’s community health centers and to visit with more than 40 onsite exhibitors. America Bracho, MD will deliver the keynote address at CHCANYS18. Dr. Bracho is the Executive Director of Latino Health Access, a Santa Ana, California-based center for health promotion and disease prevention that facilitates mechanisms of empowerment for the community, including leveraging community health workers as leaders of equity, wellness and change. This year’s General Session speaker will be Joia Crear-Perry, MD, Founder and President of the National Birth Equity Collaborative, which works to reduce Black maternal and infant mortality through research, family centered collaboration, and advocacy. Iyah Romm, founder and CEO of Cityblock Health, will also join us for our new Industry Insight Luncheon, where he will talk about Building Healthier Neighborhoods, Block by Block. We will also bring back some conference favorites, including the Regulatory and Reimbursement Mega Session featuring Peter Epp of CohnReznick and Jacqueline Leifer of Feldesman Tucker Leifer and Fidell. And we will get a federal policy update from NACHC’s Jana Eubank. New at this year’s conference, we will convene our Finance Forum. 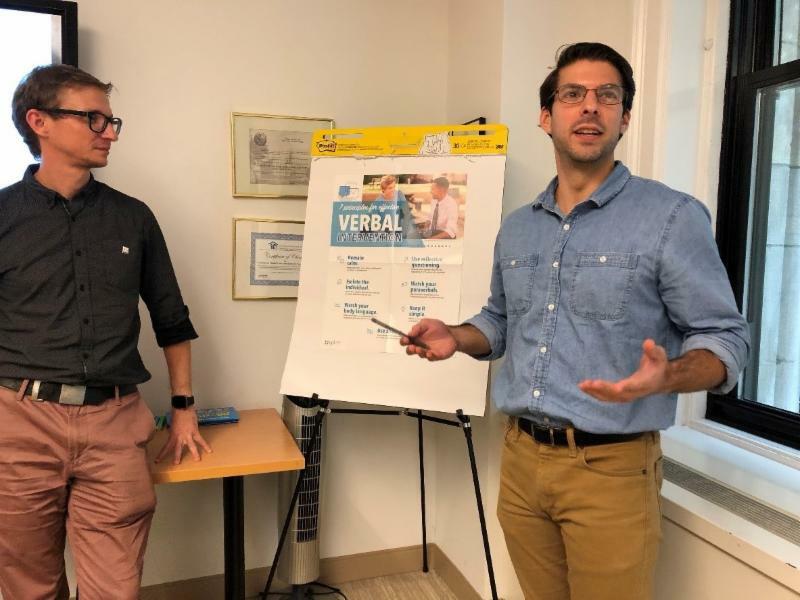 CHCANYS is working with a group of New York State Community Health Center CFOs, offering finance staff an opportunity for sharing and learning about key finance operational issues and concerns. The Forum will “kick off” during the Annual Conference as part of the Finance Boot camp on October 21. If you are an NYS CHC finance staff member interested in this forum, please email msardone@chcanys.org for more information. Also this year, The HIV/Hep C/STD Sub-committee will hold an in-person meeting. View the agenda attached here. For a sneak peek at this year’s conference book, which includes a complete schedule (page 5) and full descriptions of all of our workshops, panels, and speakers (beginning on page 7) click here. Online registration is closed, but admission is available at the door for an additional $25 fee. Contact us at conference@chcanys.org with any questions. CHCANYS’ QTI Team was happy to host a Transforming Clinical Practices Initiative Shared Learning Event in New York City. 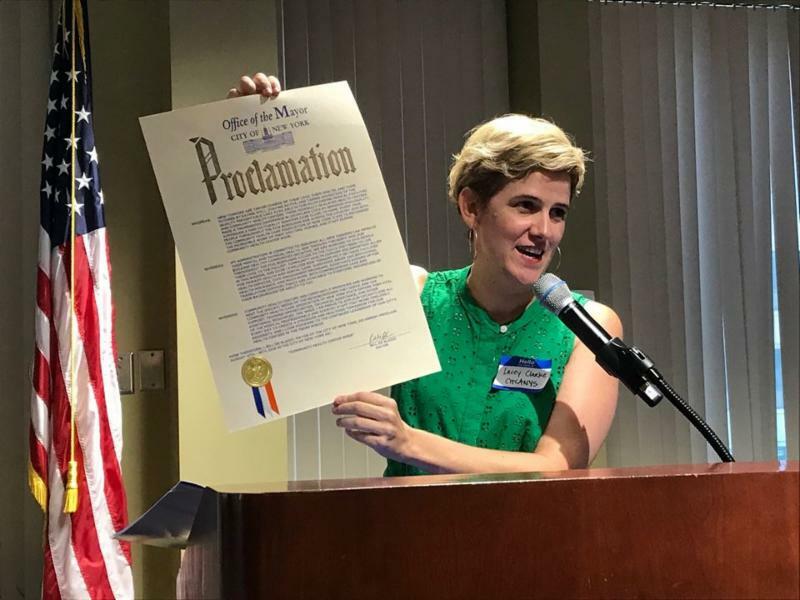 We are very excited about the work being done for our TCPI Project with six New York City-area health centers led by our wonderful project manager, Katy Wells. The six health centers are participating in the Transforming Clinical Practices Initiative, funded by CMS. The project aims to assist practices in transformation efforts to prepare for value based payment arrangements. The health centers participate in TCPI through The Greater New York City Practice Transformation Network, which also includes primary care practices of NYU Langone and several small private practices. On Friday, September 28, all participants in the practice transformation network convened at a shared learning event. During this event, Callen-Lorde Community Health Center and Settlement Health were highlighted, sharing their transformation journeys with their peer organizations and discussing their goals for transformation in the remaining year of the initiative. Much thanks to Callen-Lorde CNO Anthony Fortenberry and Settlement CMO Dr Warria Esmond for presenting! Congratulations to Lacey Clarke, Alexander Lipovtsev, and Michael Sardone on their well-deserved promotions! Lacey Clarke has been promoted to Vice President of Policy. In her expanded role, Lacey will supervise policy staff, and coordinate with Communications and the Data Team to further enhance our effective advocacy strategy. Lacey will also take the lead on CHCANYS efforts to develop a New York State FQHC Alternative Payment Methodology and shepherd the process through the state and federal governments. Alexander Lipovtsev is promoted to Director. During his tenure at CHCANYS, Alex has led efforts to grow our Emergency Preparedness (EP) program and offerings. Alex built on the base of CHCANYS’ EP services and tools, adding significantly to our menu of supports, and gave a presence on the national stage. He is also an accomplished collaborator and partner, as is demonstrated by his strong, successful working relationships. Michael Sardone is promoted to Project Manager. Since joining CHCANYS more than two years ago, Michael has jumped into the job and provided strong support to the EP program. Over the last year, Michael took over as Project Manager for several functions. He was also was the lynch pin on the implementation of two highly successful in-person trainings: the Telehealth Bootcamp in January and an Opioid Summit last June. CHCANYS will host UDS Trainings in Rochester, New York on Tuesday, November 13 at the Strathallan Hotel and in New York City at Baruch College on December 18. All grantees of BPHC-administered Section 330 primary care programs, including Community Health Centers, Migrant Health Centers, Health Care for the Homeless and Public Housing Primary Care, are required under the terms of their grant to report Uniform Data System (UDS) data, which then are analyzed by HRSA to ensure compliance with legislative mandates, report program accomplishments, and justify budget requests to Congress. The UDS also helps HRSA to identify trends and establish or expand targeted programs and identify effective services and interventions to improve access to primary health care for vulnerable populations. CHCANYS Continuous Compliance Webinar Series- Don’t Miss the Final Sessions! With the release of HRSA’s Health Center Program Compliance Manual in 2017 (and its most recent updates), FQHCs were ushered into a new era of health center compliance. The new Manual reaches beyond the longstanding “19 program requirements” and identifies over ninety distinct required compliance elements. In this webinar series, industry experts present detailed guidance and resources to enhance your organizational approach as well as recommended strategies for achieving continuous compliance. Upcoming presenters include Feldesman Tucker Leifer Fidell (FTLF) attorneys and HRSA Consultants. Registration is still open for five upcoming webinars and special rates offered for CHCANYS members. More information and link to register here . Join us and learn from your colleagues that have achieved recognition under the NYS PCMH Program during this exciting and interactive call! Guest speakers from Brooklyn Plaza Medical Center, Neighborhood Health Center, and Oak Orchard Health will be presenting on their promising practices, lessons learned, and challenges encountered with the NYS PCMH Recognition Program. Please find the agenda here , and you can register for the Webex here . Please Note - you must register ahead of time to attend. Also, help us make these calls meaningful and worthwhile by sharing your ideas and comments with us via this one-minute satisfaction survey by Thursday, October 18 . We look forward to your participation. Please contact hccn@chcanys.org with your interest, and any other questions. Over the last few years, CHCANYS Emergency Management (EM) Team, through funding from the New York State Department of Health (SDOH), offered in-person training and technical assistance sessions on emergency management to health centers located in Central New York, the Capital District, Western New York, Long Island and the Hudson Valley. Starting this fall, these enhanced in-person training / technical assistance (T/TA) sessions will be available to any health centers in New York State (outside of New York City) who haven’t yet received such a visit from CHCANYS EM team. The content of this training is customizable to the specific organizational EM needs and CHCANYS EM team will work with the interested health centers to identify/ finalize relevant content. Some topics may include, but are not limited to, an overview of emergency management concepts, elements of emergency planning, risk communications, preparedness training and exercises, or other relevant topics as they relate to the CMS Emergency Preparedness Final Rule requirements . If you are interested in this T/TA session opportunity, you can submit your request here . For additional information or if you have further questions, please contact emteam@chcanys.org . Following our last year’s webinar series on preparing for the CMS Emergency Preparedness Final Rule requirements for FQHCs, CHCANYS Emergency Management team continues to present a new 4-part webinar series on the Rule and its requirements. This new series of free webinars focuses on r elevant updates and new information available about the rule as it relates to practical tips for implementation and operationalizing its elements, and specific considerations for New York facilities. * All webinar sessions will begin at 1 pm and conclude at 2:30 pm (EST). All parts will be recorded and posted on CHCANYS’ website for future reference. For additional details and to register click here . The Corporation for Supportive Housing (CSH) and the Fenway Institute have announced an upcoming webinar and learning collaborative: Addressing Health Needs for Youth Experiencing Homelessness . Attend the session on Tuesday, October 23 from 2:00-3:00pm to learn more about this opportunity. The learning collaborative is designed for health centers wanting to serve homeless youth in the most effective way and to create health and housing partnerships for this population. Join Capital Link and Corporation for Supportive Housing (CSH) for an introductory webinar on Wednesday, October 24 from 2:00-3:00pm and the opportunity to connect with a peer group of health centers to exchange expertise and challenges focused on capital development expansion for housing and health providers. Participants will meet monthly from December 2018 to April 2019. Health Resources and Services Administration (HRSA) has requested the National Association of Community Health Centers (NACHC), in collaboration with 19 other HRSA-funded National Cooperation Agreement (NCA) organizations , conduct a consolidated national health center needs assessment. Health center responses will inform the NCAs' development of operational training and technical assistance. To participate, respond to the email invitation to complete the survey, which is available to all health centers from Sept. 12 to Oct. 31. Dr. Kristin Oliver (Mount Sinai, New York) and Dr. Sharon Humiston (Children's Mercy, Missouri) will share practical approaches to persuading parents that HPV vaccine is safe and effective in a busy clinical setting. These two pediatricians will highlight tools to get your whole office team giving not just strong, but effective recommendations. This activity has been designed to meet the educational needs of health professionals who provide and/or promote immunizations including physicians, physician assistants, nurse practitioners, registered nurses, as well as health professions students. This free national webinar is being held on Thursday, November 1 from 3:00 – 4:00pm. For more information, email info@ntc.nationalahec.org or click here to register. On Wednesday, October 30, 2018, from 2:00-3:30pm, the Department of Health, Office of Health Insurance Programs, Bureau of Social Determinants of Health, will be hosting the third in its series of Early Lessons Learned Webinars from Value Based Payment (VBP) Pilot participants. The webinar is for Community Based Organizations (CBOs), Managed Long-Term Care Plans, Managed Care Organizations, and VBP Contractors who are interested in, or are in the process of, creating and entering into a VBP contract for a social determinant of health intervention. This webinar will feature a joint presentation from SOMOS Community Care and Northern Manhattan Improvement Corporation (NMIC). Leaders from both sides will discuss the creation of their intervention along with the challenges, opportunities, effective strategies, and early successes with their social determinant of health intervention. Click here to register for the webinar. Send questions to SDH@health.ny.gov . The deadline to submit an Attestation Deadline Extension (ADE) Request for Payment Year (PY) 2017 is October 31, 2018. Eligible Professionals may use this form to request a deadline extension by providing evidence that extenuating circumstances, beyond the provider's control, prevented the provider from attesting in MEIPASS by the deadline. NYS DOH will review all ADE requests and IF granted, EPs will have until November 30, 2018 to attest in MEIPASS for PY2017. The ADE Request Form can be found here on the NY Medicaid EHR Incentive Program website and must be submitted by October 31, 2018 to attestation@health.ny.gov . Unsure about the security risk analysis (SRA) requirements for meaningful use? NY Medicaid EHR Incentive Program now offers a live webinar to help eligible professionals, especially those new to meaningful use, understand the basic definitions and actions related to the SRA which must be conducted each calendar year. Sign up here for one of the webinar sessions scheduled on October 30 and November 28, 2018. Reference materials about the SRA and other program requirements are available here . For additional assistance, please contact program support at 1-877-646-5410 or hit@health.ny.gov . The Bureau of Health Workforce (BHW), a division of the Health Resources and Services Administration (HRSA), is behind schedule on its updating of the automatic health provider shortage area (auto-HSPA) scores for Community Health Centers. The process, however, is continuing and BHW is finalizing its first impact analysis, including initial estimates of updated auto-HPSA scores. Those estimates will be sent to state primary care offices in late August, roughly two weeks before Community Health Centers receive their scores. These scores will be for informational use only and are subject to change between now and spring 2019, when HRSA plans to finalize and update all auto-HPSA scores nationally. According to HRSA, a "large number" of NHSC providers are currently placed based on auto-HPSA scores that have not been updated since 2002 or 2003. If their host facilities see their scores decrease significantly, they may lose their ability to recruit new NHSC providers (although they will be able to retain those they already have). Through a database, HRSA shared the complete lists of all geographic areas, population groups and facilities designated as primary care, mental health, or dental care Health Professional Shortage Areas. Click here to find your score. The Physicians Foundation, a cooperative effort of many state medical societies, recently issued its biennial physician survey, conducted by Merritt Hawkins. Download your copy of the survey here . The Survey results show that 78% of physicians often or always experience feelings of burnout, 46% plan to change career paths, 80% are at full capacity or overworked and overextended. Read more here .